Whoa now! The FADER just premiered Blood Diamonds’ remix of “Anything Could Happen”, the lead single from Ellie Goulding’s forthcoming album, ‘Halcyon’. Right off the bat, this track sounds like Goulding gone Grimes which makes perfect sense in light of the fact that Blood Diamonds and the Montreal synth-pop diva are good friends. 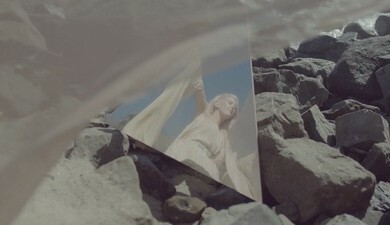 However, unlike Grimes, Goulding’s vocals are unambiguous and her lyrics more straightforward. Paired with Blood Diamonds’ sensationally sweet production, Goulding sounds as stunning as ever. Crisp, clear and cutting-edge, just what a good pop song should be.